Why do I need a Roof Shampoo? The NON-bleach, green, ECO-FRIENDLY, low pressure Roof Shampoo® roof cleaning method uses a specially formulated buffered product that is safe on all asphalt and fiberglass shingles. It will not harm any landscaping around the home, yet is 100% effective at removing algae, lichens, and moss from shingles. No damaging high pressure is ever used and absolutely NO scrubbing or brushing. FACT: Shingle Manufacturers are using Roof Shampoo® Contractors to provide warranty roof cleanings for their customers. Our proprietary Roof Shampoo® rinsing system, along with our Roof Shampoo® eco-friendly stain removing products ensures that we clean ALL the algae, lichens and moss under the edge of every shingle. 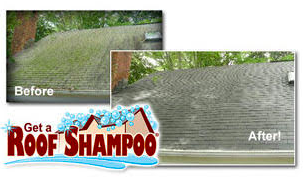 A spray-on leave-on product, or a system that claims to use no pressure simply does not use an efficient rinse system and cannot COMPLETELY remove the algae, etc.. With the Roof Shampoo® roof cleaning system, there is no waiting, no wondering, and no worrying if the stains will really go away. You will see for yourself that the algae, moss, and/or lichens and their stains are completely gone before your Roof Shampoo® contractor leaves your house. If our process costs more than just splashing bleach on the roof costs, it is because skilled technicians using the NON-bleach Roof Shampoo® roof cleaning method take the time to actually get on your roof, inspect it, and do the job right using high quality, eco-safe products and state-of-the-art equipment which really clean your roof. 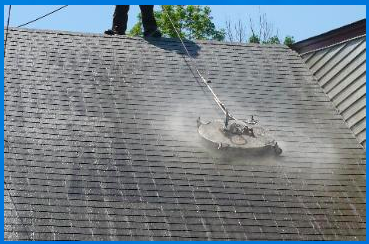 Roof Shampoo® contractors are professionals who make sure they clean every square inch of your roof without damaging your shingles or your landscaping. PLUS, our Roof Conditioner™ stain prevention program provides you with the option of a lifetime guarantee against roof stains by participating in the Annual Stain Protection Program.